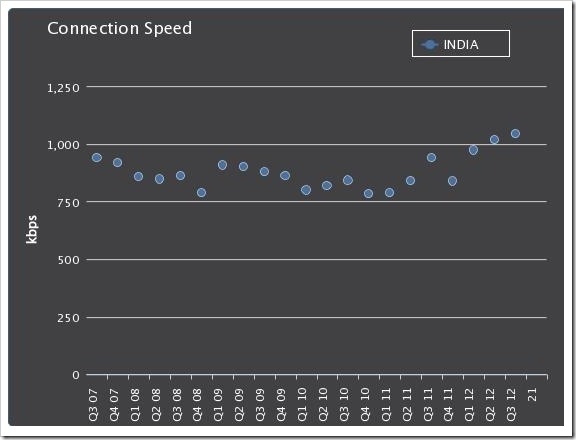 Average Indian Internet Speed improves, albeit marginally! 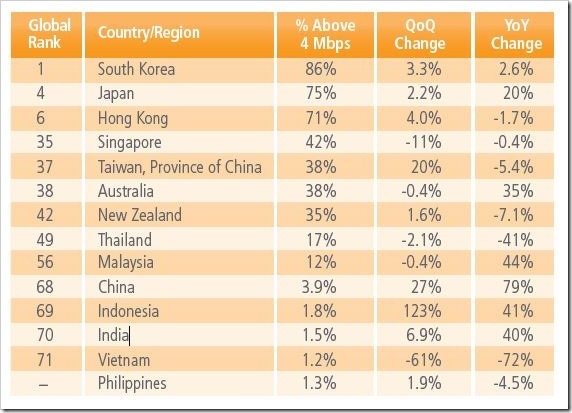 Akamai recently released their popular State of Internet report for the 3rd quarter of 2012, and average Indian internet speed are on the rise. At 1044 kbps (meaning marginally above 1mbps), they are at their lifetime high. 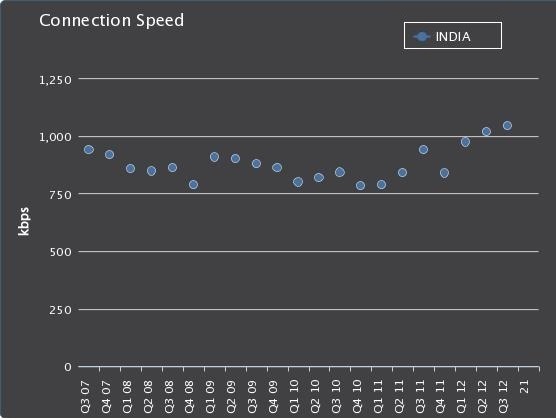 In 2nd quarter of 2012, India witnessed average 1 mbps internet speed for the first time. Third quarter witnessed marginal improvement of 2.5 percent over previous quarter. Even though internet speeds are at a lifetime high, compared to other countries, India ranks very poorly. India ranks at 120th position worldwide and lowest in Asia. Comparatively, China registered an average internet speed of 1.6 mbps. The average peak connection speed in India has increased nearly 140% since Q3 2007, while China’s has increased nearly 250% over the same period. At the global level, the top 3 countries are all from Asia, with South Korea registering 14.7 mbps average internet speed, followed by Japan at 10.5 mbps and Hong Kong at 9 mbps. While Year on Year growth in average internet speed was 11 percent, the peak internet speed did increase at decent pace. The peak internet speed registered in India was 8 mbps, which 9.3 percent higher compared to last quarter and 39 percent compared to last year same quarter. Hong Kong registered highest peak internet speed with 54.1 mbps, followed by South Korea (48.8 mbps) and Japan (42.2 mbps). 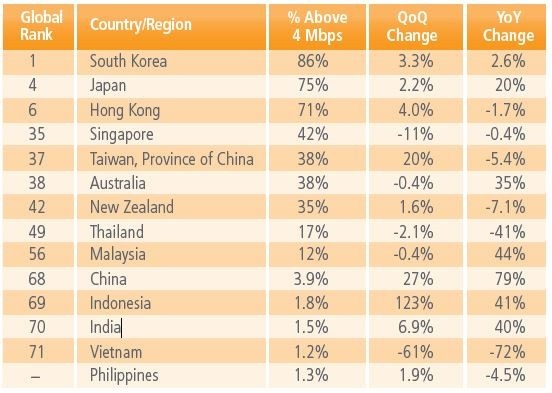 Less than 0.1 percent people in India had high broadband (>10 Mbps) Connectivity compared to 52 percent in South Korea. India also ranked very low when it came to normal Broadband connectivity (> 4mbps), with only 1.5 percent people having speeds equal or above that. So, although India is witnessing improvement in its broadband internet speeds, they are still much below global averages. And, for India to be integral part of existing technology revolution, it is important that our broadband speeds increase. Galaxy Note 8.0 – Is Samsung creating dual flagship brands in Tablet space as well? Also I forgot to mention another factor which is very important in Internet data travel. It is Sub sea FOC (Fiber Optic Cable) connectivity. I think India is far away from the main traffic. China overlooks US, Japan, Australia across Pacific. Also Singapore, Hongkong, Taiwan are just a stone throw away. Korea is a neighbor. Where as India is far from the main traffic routes. The nearest busy point for internet is Singapore across Malacca Strait, a difficult route. Satillites alone can not generate speeds and depend on weather. FOC is a reliable mode of traffic. Here I feel India has achieved some thing. It is not great for small countries to give big internet speeds. All they need is about 100 towers. Hong Kong, Singapore, Taiwan, Japan and Korea all put together are smaller than one Indian state to cover. So its not a big deal. Also satisfying is that we are not far behind China. Just now reading an article in Business Standard which says RIL will roll out 4G LTE services by August in Mumbai, Delhi and Jamnagar to start with and expand all over India fast. I hope this will give a kick to the average internet speed figures upwards. Always a pleasure to read your comment…. Like I have mentioned in the article, it is good to see that India is improving even though only marginally. Yeah. I did not think about that. India is “The” Software hub of the world. Still we are behind China. May be the reason is in the past 20-25 years China developed their infrastructure at such a speed that they are far ahead even many European nations. May be their IT/Telecom budgets also are massive. Also in India we were stuck up in 2G / 3G scams and lagged behind. But what pinches me is how come both India and China are behind Thailand?